No matter what fuel your vehicle uses, gasoline, diesel, electricity, wind or solar power, it will always need maintenance for its different systems, and we can perform it! Since 1949 Boradori Automotive has been staying on top of automotive technology and we will be keeping up with technology for another 70 years. When it is time for scheduled maintenance, oil changes, filter replacement, cooling system flush, smog & emissions testing, transmission service, driveline service, power steering flush or any other auto maintenance bring your vehicle to Boradori Automotive. We can handle any job on your car, truck or SUV. Call today to schedule an appointment for AAA approved auto maintenance in Chico! The most important thing you can do for your vehicle is change its oil on a regular basis, generally every 3,000 - 5,000 miles or more depending on manufacturer recommendations. Changing the oil not only ensures the engine's moving parts are properly lubricated but it removes dirt and grime from inside the engine and fresh oil helps maintain a proper operating temperature. And of course we will also change your oil filter! Maintaining your cooling system is important to avoid overheating, which could cause major engine damage requiring extensive auto repair. 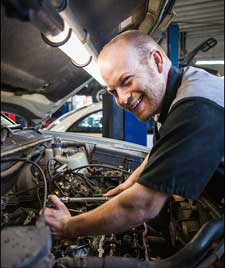 Our service technicians will inspect the radiator and hoses and perform pressure checks. We will let you know if anything is at risk of failing in the near future to help prevent breakdowns. When you car leaves the factory it already has appointments set with the auto repair shop. There is no law that states you need to bring your new vehicle back to the dealership for service. Our local auto repair shop in Chico can maintain your vehicle's warranty while performing 30/60/90K service or any other maintenance or repair need. Our shop is equipped with the latest technology in automotive service, including diagnostic equipment and the tools necessary to reset vehicle computers. Your vehicle is a big investment, so it is important to take care of if it the best that you can. The professional mechanics at Boradori will not only take great care of your car but we will take care of you. We offer 24 hour towing and a free local shuttle service, so you don't have to worry about finding a ride to the office or back home when you drop your vehicle off for maintenance. Call to schedule an appointment for vehicle maintenance in Chico today! "Boradori Automotive has always been very good. They are very family like, and every time I go in it feels like I'm going to see friends, friends who take my car in for service." 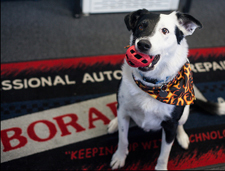 "Boradori Automotive is great. I have been using them for probably around 20 years. I trust them. They always do good work, and the car comes out fixed. You can't ask for anything more than that. They always seem to fit me in, and if there is a problem they take care of it. I have been very satisfied."